Besides his main gig playing drums for Madison's Mama Digdown’s Brass Band, Jordan Cohen plays in projects varying from jazz (Kid Jordan Second Line) to rock (The Optimistic) to country (The Self-Helps). So it’s not surprising the mish-mash of inspiration he pored into Onlooker, the debut album for his electronic alter ego, Chants. 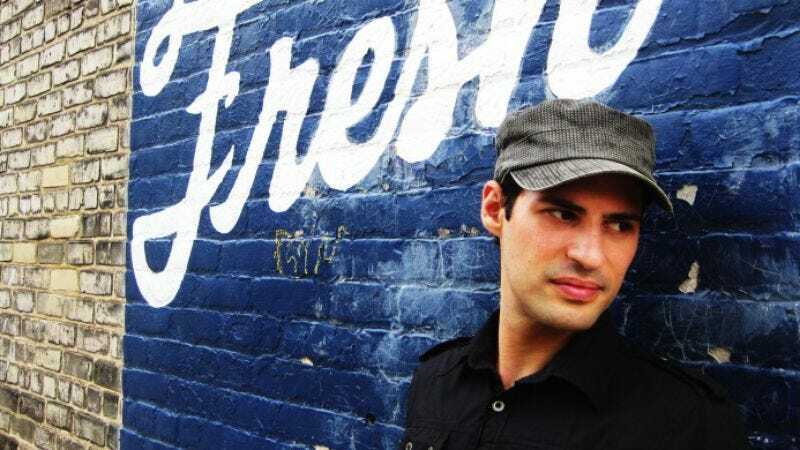 With a laundry list of local collaborators and an arsenal of both traditional instrumentation and found sounds to run through his sonic filter, Cohen stakes out territory between the chopped-up jazz of Amon Tobin (“Black Ants”) and the skittish, jubilant bounce of Four Tet (album stand-out “Vilas Victoria”). With the album in the can and nearing its Sept. 21 digital release, The A.V. Club caught up with Cohen as he prepares to play his first show as Chants on Sept. 17 at The Frequency. The A.V. Club: You’ve been making electronic music on the side for a couple of years, but got serious about releasing something early this year. Do the tracks on Onlooker date back to your initial work with electronic music? Jordan Cohen: Some of the tracks on Onlooker go back that far. There’s maybe one or two tracks that were some of the earliest ones that I worked on with my friend Scott Lamps who did a lot of work on the album. But I never really had the idea of making an album or really finishing something until about a year ago and then I said, “OK, I’m just going to use the tools at my disposal, try to finish something, and see how it shapes up.” Some of those old tracks did make it on the album, but most of the work was done in the last year. AVC: Which tracks on the album represent your early work? JC: There’s a track called “Objay Dart” that’s very old, and then the last song on the album, “Spaghetti Midwestern,” is also one of the oldest ones. I wasn’t necessarily sure of putting those on there, but people, especially with “Spaghetti Midwestern,” seemed to really respond well to it. And I also did add some new parts when I did the bulk of the recording a few months ago. AVC: Along with jazz on “Black Ants” and video games on “Day Glow,” there are a lot of influences at work on Onlooker. JC: That’s definitely true. I think to an extent it’s first-album syndrome, because I do listen to a lot of music, and I like playing a lot of different music, so I wanted to get it all in there to say, “OK, this is me.” I did worry that the album would be too all-over-the-map and I often would have an idea, do one or two tracks in a certain style, and think, “Maybe this is the sound of the album. Maybe I’m going to do 10 songs that sound like this.” But then I would get bored or get inspired by something else, and I would do a few more tracks in another style. So I hope it hangs together as a cohesive album. I think there are things about it that draw it together, like the way I recorded it, the people involved, and the sound. I think in the future, now that I’ve gotten a few things out of the system, I’m going to try to focus my sound a little more. AVC: You’ve never played a live show as Chants. How are you preparing for your first concert? JC: It’s been an interesting process, trying to figure out how to pull it off live. What I’m doing now is I acquired a sampler and I’m taking parts of the album, going back through the original tracks, and I’m basically cutting up some of the parts so that I can trigger them live with the sampler. At times during the show I’ll be playing with some backing tracks and manipulating some of the samples live, and also playing some live percussion, like pots and pans and some drums. Mostly going up there alone, but on one song I’m going to have some of the people from the album, Brandon [Beebe] and Louka [Patenaude], play on “Onlookers.” But for the most part it’s going to me and hopefully that will provide enough interest. It’s always a trick with electronic music, you want to walk that line where on one hand you don’t just want to hit play and on the other hand if I was to get a band and try to play these songs live, I don’t think it would be very interesting. To me, the most interesting part of the tracks is the digital manipulation of some of the sounds. AVC: A lot of electronic acts incorporate some sort of visual element when they play live. Any plans for something like that? JC: I definitely thought about doing that. It does take some of the pressure off being just a dude standing up there. I feel like it’s kind of become a cliché, you know, the guy up there with his laptop and projecting videos or photos. But that’s not really to knock it. It’s mostly because I’ve been too lazy to put something like that together. In the future I’d love to do something like that, and there have been all kinds of things that have run through my head, just getting friends to go up there and dance and say “Hey! Look over here!” We’ll see what happens. I’m going to start small. AVC: The album features a lot of non-traditional percussion. What kind of stuff did you use? JC: A lot of it was due to recording at home, so a lot of the percussion elements were just things I found in my kitchen that I would sample to see if I could get an interesting sound from and cut up. I also really like using elements that are normally textural, like static or the sound of a vinyl record, which I would distort and cut up into rhythmic elements. It’s things I hear a lot on records that are often just used for more background sound and atmosphere. And it is that, but I like to always make things rhythmic and part of the beats. I really haven’t decided everything that’s going to be on my little table, along with my sampler and drums. Maybe I can just check out the alley and find some good things to hit. AVC: You play drums in a lot of non-electronic bands around town. How has that influenced the work you do in Chants? JC: It definitely influences everything I do. There were points where I wanted more live drumming on the album, but I just didn’t have a recording situation to record live drums well. I did a lot of it in my apartment or other people’s apartments. So the sound of the album is kind of getting around that limitation. I would record one thing, sample it, and then chop it up and move it around on the computer. But actually it’s gone more the other way around: Doing a lot of sequencing and sampling and making beats electronically has influenced my live drumming. AVC: The list of musicians who contributed to the album is pretty impressive. JC: Everyone on the album is someone who I feel really fortunate to work with, and they’re generally people I’ve known for a long time and have played with in a lot of different circumstances. Scott Lamps—he did a lot of the arranging. He’s a guy I met in college in Richard Davis’ Black Music Ensemble at the university. He also plays bass in Kid Jordan Second Line and he works as an arranger, producer, and engineer around town. He’s a guy who just has such a musical mind that it really is his native language. A lot of the stuff on the record where there’s sophisticated harmony and string arrangements, that’s all Scott. He’s pretty amazing with that, and his girlfriend, Ida Jo, played all the violin tracks. Scott would give her the notes, and she would lay seven parts on top of each other and she would alter her tone when she did that overdubbing, so it didn’t sound too fake. Brandon Beebe, who I play drums with in a band called The Bombshelters, we share a lot of the same love for Prince and R&B. He was good enough to do all the vocals on the album, at least the vocals with words. He’s definitely a pop guy. He sang on “Onlookers” and “Objay Dart.” Patrick Breiner, who I hadn’t played with as much as some of the others, but he’s a great guy and amazing saxophone player. He came in, cut his stuff in about a couple of hours, and then I was able to do a lot of editing and playing around with his parts. He does this thing at the Project Lodge called “Surrounded By Reality” where he brings in lots of free jazz and improv, amazing musicians from around the country, and gets them to play in Madison.